After trying out a batch of these French Toast Muffins from Muffin Mama, I can attest that they are as scrumptious as they look! As part of Muffin Tin Month, Carmel is graciously sharing one of her muffin recipes, along with some gorgeous photos. Her blog is all about what you can do with a muffin tin! To kick off the pumpkin season, the food world seems to be baking with orange-hued vegetables like carrots, squash, and sweet potatoes. Culinary creators are enhancing dishes with seasonal spices like nutmeg, cinnamon, and ginger. These fall tastes bring memories of home and hearth so much so that there is no doubt about the level of comfort in the autumn-inspired muffin. Variations include pumpkin cream cheese, carrot cake, sweet potato, and honey corn. However, when I think of Autumn and its ultimate comfort food, I think of French toast. It’s a breakfast classic. Often served with maple syrup or jelly. Sometimes finished with melted butter and salt. My grandmother, whom I remember making breakfast in her hot pink bathrobe and slippers, would serve French toast dusted with powdered sugar. The following recipe takes me back to her. It’s a muffin that’s light and fine. Its taste is French toast. Its texture, more delicate. Both toppings below are equally delicious. The first is a cinnamon and sugar glaze, and the second combines the traditional tastes associated with French toast: drizzled maple syrup and powdered sugar. As on French toast, apply the topping by drizzling. 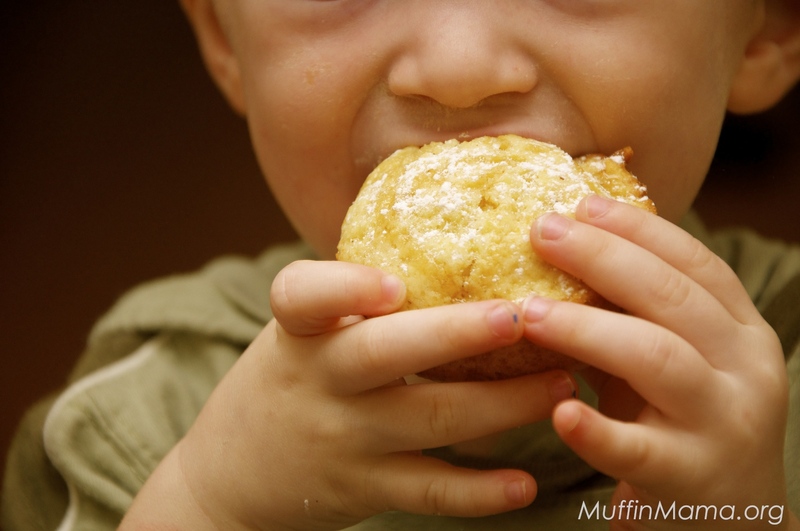 Or, dip each muffin into a puddle of maple syrup and a mound of powdered sugar or cinnamon-sugar mixture. 1. Preheat oven to 350 degrees F (180 C). Grease muffin cups with cooking spray or line with paper muffin liners. 2. In a medium mixing bowl, stir together flour, sugar, baking powder, nutmeg and salt. Make a well in the center of the mixture. 3. In a separate bowl, stir together egg, milk, and melted butter. 4. Add egg mixture to flour mixture; stir until just moistened (batter may be lumpy). 5. Spoon batter into prepared muffin cups. 6. Bake for 20 to 25 minutes. 7. 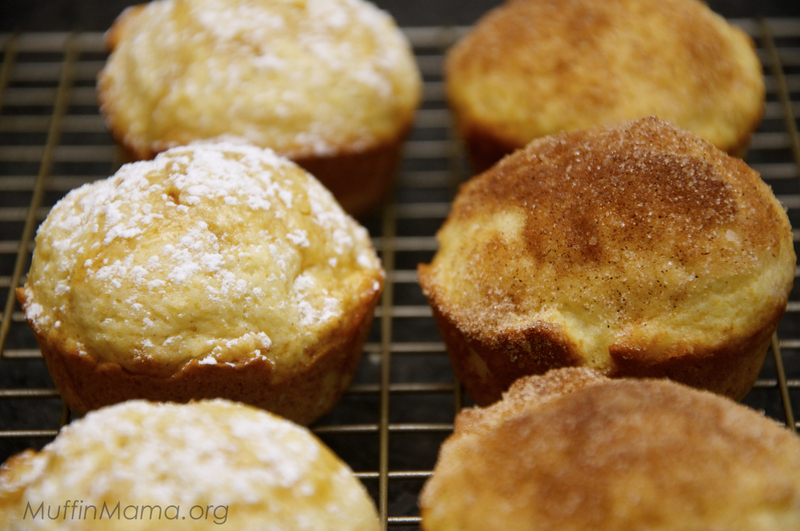 Top each muffin with one of the two coatings (recipes below) and serve warm. *Note: For dairy free muffins with coconut milk, you may need to add about 2 tablespoons more liquid, such as water. 1. In a bowl, combine cinnamon and sugar. 2. In a separate bowl, melt butter. 3. Dip tops of finished muffins in the melted butter, and then in the cinnamon sugar mixture. 1. With a toothpick, poke a few holes in muffin tops. 2. Spoon over a good quality maple syrup. 3. Sprinkle powdered sugar on tops. And that’s how they taste! Both the cinnamon sugar and the maple syrup with confectioner’s sugar toppings are superb. Enjoy!